in Sutton Coldfield West Midlands, Four Oaks, Mere Green, Little Aston, Lichfield and Tamworth. 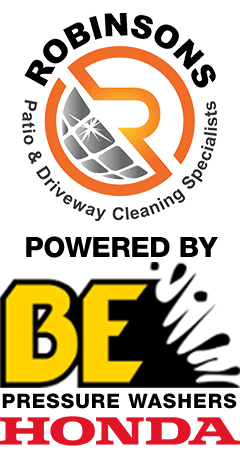 We offer a fast, safe patio and driveway cleaning service that’s great value for money and hassle free in Sutton Coldfield, Four Oaks, Mere Green, Little Aston, Lichfield and Tamworth. At Robinsons PDCS we use the latest commercial high pressure rotary surface cleaners, paired with our petrol engined pressure washers. Our Honda Powered BE pressure washers feature a 24″ Whirl-A-Way rotary unit fitted with a 16″ Water Broom. This system will transform the appearance of your driveway & patio by removing all dirt, weeds and moss without disturbing the substrate. The utmost care is taken to protect your flowers, shrubs and lawns and our operatives are professional and courteous at all times. Robinsons PDCS do not use any harmful chemicals in any of its cleaning processes – our machinery operates at up to 3,000psi, many times higher than domestic pressure washers meaning harsh chemicals that damage the environment are not required. Block paving can become infested with weeds, grass, algae, lichen, and moss to bring your expensive block paved areas back to near new condition Robinsons, the patio and driveway cleaning specialists will first brush the area to be cleaned to remove any loose objects, then rotary clean and power wash the entire area. All residues are removed and once the area is dry we will re-sand the area with suitable kiln-dried sand (this may mean returning on a dry day). We can also apply an optional sealer to block paving that will make your driveway look like new, preserve the surface for longer and help to prevent any regrowth of weeds, grass, algae, lichen, and moss. Decking can look great when first installed but, unless its maintained, it can become dirty and faded. Stains from plant pots and garden furniture can often soak into the timber. Algae growth on decking can also leave it very slippery when wet. Robinsons, the Patio and driveway cleaning specialists can clean wooden decked areas without leaving marks or gouges and remove virtually all algae, dirt and stains to restore the natural finish of the timber. The same technique can be used for your garden furniture. We recommend cleaned decking and furniture are treated with an appropriate coating after drying. With wear and tear and our varied climate, tarmac surfaces can tend to break up as the binding agents are damaged which allows the aggregate to break away leaving small holes. After cleaning we can repair your driveway and treat it with a restoring agent. A cleaned tarmac driveway can be brought back to nearly new condition, without the expense of relaying it with fresh tarmac. We use an asphalt emulsion (water based) environmentally friendly sealer designed to make tarmac driveways and surfaces look as good as new by restoring their colour at a fraction of the cost of replacement. A range of colours is available to suit your tarmac finish. Patios and paths can become dangerous and unsightly if not regularly cleaned, especially during the winter due to algae. We can restore your path or patio, no matter if it is concrete, natural stone or block-paving. Our rotary cleaner will bring it back to life using variable high pressure water at pressures 4 / 5 times that of a standard jet-washer, the rotary head cleaner will not leave unattractive “striping” like a standard lance on a jet-washer, also splashing is minimal it works at ground level. Decorative garden walls, standard brick walls and wall cappings can also be cleaned and restored. All our staff are trained in Health & Safety and Customer Service. We’re local, reliable and friendly, and we offer a valued and affordable service to all areas of Sutton Coldfield West Midlands, Four Oaks, Mere Green, Little Aston, Lichfield and Tamworth. Have a look at our Testimonials page to find out what our customers are saying about the service we provide and the value we bring to your properties and premises.